Check out this superb article by linguist, lexicographer, columnist, and self-described “all-around word nut” Ben Zimmer (@bgzimmer) in The Atlantic. Ben discusses the cultural misappropriation of words and how sherpas, ninjas, and gurus crop up everywhere: Why Do Supreme Court Nominees Have ‘Sherpas’? Indeed, but you may also be adding a layer of mysticism to the unfortunate localizer who has to figure out what these words really mean in English before attempting to transcreate them in another language. “Storyteller”. All a matter of context. And credibility. 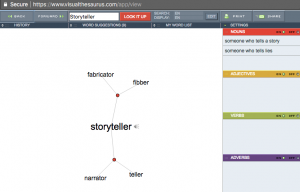 Example from The Visual Thesaurus. The tech industry is notorious for this sort of nonsense, going far beyond the annexation of those Asian words mentioned to create even more grandiose, mystical job titles that frankly make no difference to the job description or employee performance itself. Plus, how do you localize Direct Mail Demigod? Digital Nomad? E-Commerce Wingwoman? Are HR professionals now spending time at Harry Potter, Star Wars, Star Trek, and Marvel movies to come up with some of these daft titles? The now over-used title of storyteller really gets me going. Throw a stone in any pub in Ireland and you’ll still hit 100 storytellers (although we have considerably more colourful names for these characters). Lucy Kellaway, formerly of the Financial Times, and a legend for calling out corporate BS, had it with the craze for the word storyteller years ago: Dentists and plumbers do not tell stories. Nor should you. My pet word hates from the user experience (UX) world have to be that job persona road warrior (translation: traveling salesperson) and then there’s that rockstar suffix du jour (translation: exceeds minimum professional requirements, now and then). 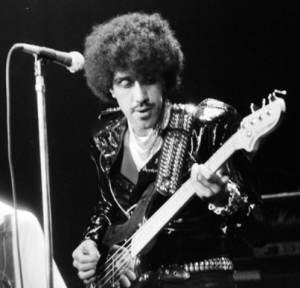 The late, great Dubliner Phil Lynnott of Thin Lizzy. Image shared via Wikimedia. Thin Lizzy have a belter of a song called “Don’t Believe a Word“! See? No laptop covered with stickers in sight. No electric scooter on stage. That thing is an electric bass guitar. Until Lady Gaga and Lenny Kravitz start winning awards for full-stack software development, you know where you can stick your rockstar title. And so it goes on. There are probably gurus who have the job to misappropriate words from other cultures and make roles and titles sound a lot more interesting than they really are but without paying the employee anything extra. I think Peter Drucker nails for this kinds of poseur hell: “I have been saying for many years that we are using the word guru only because charlatan is too long to fit into a headline.” Or fit into a tweet.